Faith-based schools should encourage a spirit of enquiry into their core beliefs and how these relate to wider society, on the assumption that if the beliefs are true, they will withstand detailed inspection. Outside the boundaries of the faith-based school, however, there is a different ethos, and students may spend much time in that environment. Secular and humanist groupings have little sympathy with such schools and public support is mixed. 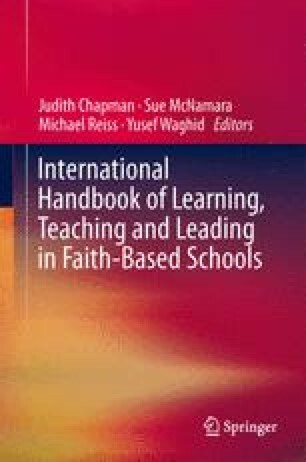 After making some general points about world views, this chapter looks at the challenges faced by faith-based schools, with particular reference to the English scene. Science is often cited as the main reason for rejecting religion and faith-based schools. Suggestions are therefore offered to such schools concerning their role and responses to current debates concerning science and religion in society and its institutions. Bacon, F. (1625 first published). Essays or counsels, I. Of truth. Works VI, 377–379. http://fly.hiwaay.net/~paul/bacon/essays/truth.html. Accessed 29 June 2012. Feser, E. (2010). The early Wittgenstein on scientism, Tuesday, June 1, 2010. http://edwardfeser.blogspot.co.uk/2010/06/early-wittgenstein-on-scientism.html. Accessed 20 June 2012. Wittgenstein, L. (1922). Tractatus Logico-Philosophicus, 6.371/2 (C. K. Ogden, Trans.). London: Kegan Paul, Trench, Trubner & Co. http://www.gutenberg.org/ebooks/5740. Accessed 13 Sept 2012.